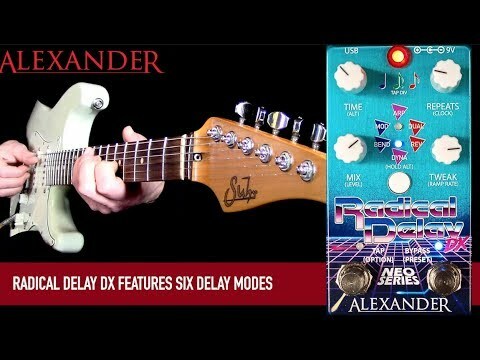 Radical Delay DX features six delay modes, all of which are adjustable to play from 24kHz down to 1.6kHz bandwidth using the CLOCK knob. 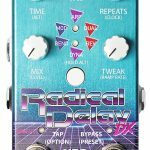 We released the first Radical Delay pedal way back in 2015 as an homage to the tones and aesthetic of the 1980s. We were shooting for video games, neon nights, and maybe a hint of ALF. It’s now 2019, and according to conventional wisdom we should be fighting with replicants in the streets and competing in futuristic running-based game shows. Since that stuff hasn’t quite happened yet, we thought it might be time to update the Radical Delay to our Neo Series platform and give it a bit of a makeover at the same time. Inside you’ll find the same great delay and special effects that made the earlier Radical Delay pedals so fun, plus a few new twists. Outside, we’ve added some teal and chrome, and intensified the laser grid for your enjoyment. The maximum delay time varies by mode and clock rate, but it varies from 680ms to over 5000ms. Yep, that’s over 5 seconds of delay time, but it sounds terrible. It’s gross. Don’t say we didn’t warn you. MOD Digital delay with modulation. Tweak controls the mod depth and ALT controls the mod rate. BEND Pitch shifted delay. Tweak selects the interval (-12, -7, -2, -1, detune, +1, +2, +3, +4, +5, +7, +12) and ALT puts the shift before or after the delay. DUAL Dual-tap delay line. Tweak controls the delay time for the second tap and ALT controls its feedback. REV YALED ESREVER. Tweak warps the delay from forward to reverse, with “tape stop” sounds available in between. ALT mixes between the main reverse delay and a forward delay. Just want reverse? Set Mix, ALT, and Tweak to maximum. ARP Chiptune arpeggiator delay. Tweak controls the speed of the arpeggiation and ALT selects from 8 scale options. DYNA Dynamic delay. The delay time sweeps with your picking attack. Tweak controls the sweep amount and direction, and ALT sets the volume sensitivity. Be careful with short delay times – that’s where the laser birds live. Four built-in presets give you quadruple the tones in a single footprint. Add a MIDI controller for 16 presets. Seamlessly morph between different knob settings on the fly using the Option footswitch, expression pedal, Neo Footswitch, or MIDI controller. Connect an expression pedal, Neo Footswitch, or MIDI controller to this jack to add performance control to your pedal. Tap the left footswitch for tap tempo. Hold the left footswitch for Tap Tempo Subdivision or Ramp Morph. Set the pedal trails from 0-10 seconds. The pedal will automatically perform a smooth fade at your chosen time. Adjusts the operating frequency of the DSP in real-time. Turn this up for pristine digital delay, down for glitched-out garbage. Every knob and setting on the pedal is controllable using MIDI. Connect using the MultiJack and our Neo Link or directly to any Disaster Area Gen3 controller. Tap this button to select a new sound mode. Hold it down to access the alternate knob functions (listed in parentheses). Every Neo Series pedal features a USB port for MIDI control and firmware updates. User Manual and firmware are available here.